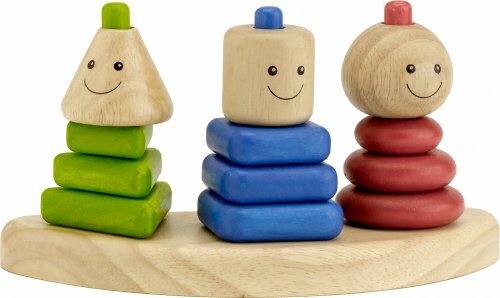 Voila wooden toys – for more than simple play! You can’t beat wooden toys for a durable and eco friendly option for children’s playthings. These ones from Voila are beautifully bright and beg to be played with. Voila toys are crafted in Thailand and carefully designed to spark children’s imaginations while encouraging their physical and mental development. While all that sounds very complex, it’s easily done through simple play. Babyologists, you won’t be surprised I have a favourite. The Fun Flower stacking toy looks lots of fun and the finished flower pot is charming perched upon a bedside table or shelf. You can choose a pink flower with turquoise pot or yellow flower with red pot. The Sound Vehicles set include three different shaped vehicles in eye catching bold colours. Voila has incorporated a different sound device into each vehicle which I’m sure will be plenty of fun for little hands and ears. I have to mention the cheeky looking Geo Trio (pictured top), a great affordable toy at $25.95 that can be passed from sibling to sibling. The Fun Flower costs $19.95 and Sound Vehicles set $29.95 from Billy Lids. Delivery within Australia and beyond is available.